Basecamp Classic: What is the Daily Digest and how do I subscribe to one? 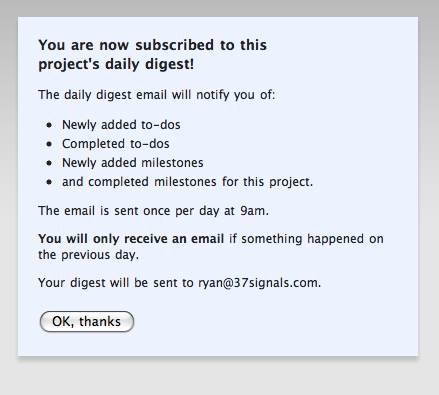 The Daily Digest is an email that Basecamp sends you once a day. 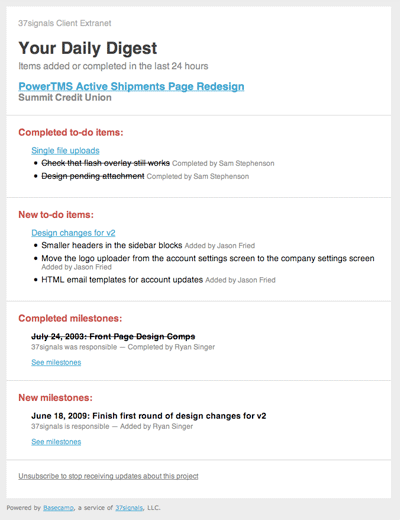 The email tells you about any to-do items or milestones that were checked off or added in the last day. Daily Digests are per-project, so you can subscribe to the projects you really care about without being distracted by any unnecessary information. Now you’ll always know day-by-day as work is completed or new work is assigned. It’s a really powerful feature.